1.) First and foremost, it's just a really attractive deck, with seductive characters and exotic locations. Moreover, this is a long hair enthusiast's ideal tarot deck, since practically everyone depicted in this set of cards is endowed with extraordinarily long hair. 2.) It conforms almost completely to the Rider-Waite standard, with the suits and major arcana possessing their usual names. There's only 1 difference between the contents of this deck and the info on the Zarcana Reference Card: the values for Strength and Justice, 8 and 11, are reversed. 3.) 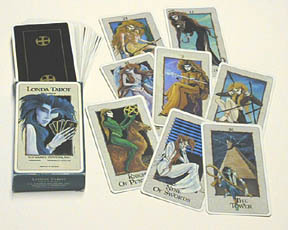 The numbers on the Major Arcana cards aren't in Roman numerals, as they often are in tarot decks. 4.) The Londa Tarot has 2 very nice title cards, one of which just has a character asking the question "Who are you really?" We always use these two cards as the Gateway and the Doppleganger; in fact, John originally cooked up the Doppleganger's power specifically for the Who are you really? card.